Noblesville, Indiana is located just north of Indianapolis and is the 14th largest city in the state. Diverse, affordable neighborhoods, excellent schools, thriving businesses, and a community-based atmosphere are what makes Noblesville such a great place for people to call home. The pest experts here at Action Pest Control understand Indiana pests and how to successfully control them in and around both homes and businesses. Residential pest control services, commercial pest control services, and mosquito control services are just some of the ways we can help to keep your family and customers safe from damaging and dangerous Noblesville pests! 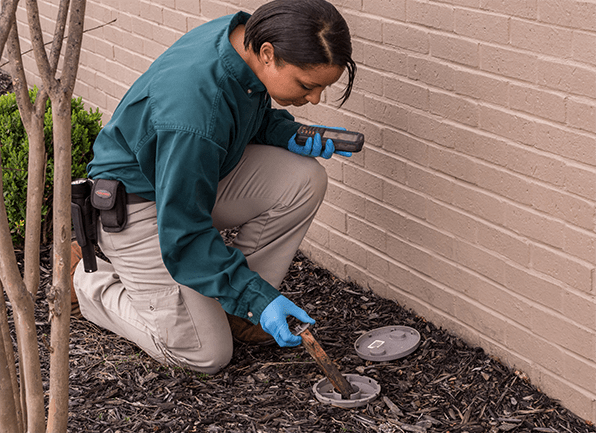 The best way to control the wide variety of pests that live in Noblesville is to put into place a year-round pest control program. Year-round pest control works to eliminate current pest issues that are in and around your home while providing the protection that is needed to ensure that pests won’t become an issue for you and your family again- summer, fall, winter, or spring! Below is a brief overview of our effective residential pest management solutions which are always scheduled at your convenience! Our basic program provides customers with exterior pest defense services along with cobweb removal. The advanced program provides customers with both exterior pest defense and interior pest treatments. This program includes cobweb removal, window sill vacuuming, placement of exterior rodent stations, rodent control services, as needed pest proofing, unlimited services calls, and services that are fully guaranteed! This program includes everything that is found in the Advanced Pest Control Program, it also includes an annual attic inspection, termite monitoring services, and a termite inspection. The Premier Program is our most comprehensive program and provides the most complete protection for your home. This program includes a termite warranty and termite treatment in addition to providing all of the pest control services that are found in the Complete Pest Control Program. At Action Pest Control we provide our commercial customers with highly effective customized pest control services. Our highly trained service professionals understand the unique needs of business owners and through the support of supervisors, managers, and board certified entomologists will keep your Noblesville commercial facility free of pests. Through integrated pest management we partner with you to create a setting that does not attract pests. Our 10-step preventative pest management program includes: inspection, monitoring, identification, sanitation, exclusion, harbor reduction, mechanical controls, environmental controls, product application, and documentation services, all to completely eliminate current pest problems and of course prevent future ones! Learn more about Action’s commercial pest control services. Action Pest Control is dedicated to providing Noblesville property owners with the services needed to control mosquito numbers and reduce the risks that they pose to you, your family, and/or customers. Our mosquitoes control services include an inspection by one of our professionals to find mosquito breeding areas on your property. We then provide treatment using EPA approved mosquito control products to reduce the number of incoming mosquitoes and to prevent mosquito larvae from being able to hatch into adults. In addition to putting into place a mosquito control program, the following tips can help you to reduce mosquito numbers on your property. Reduce areas of standing water on your property. Make sure that gutters are unclogged and are in working order. Reduce flowering landscaping that is planted near the outside of your home. To help prevent mosquitoes from entering into your home make sure that screens in windows and doors are completely intact. Caulk gaps found around exterior doors and windows. There are many reasons to choose Action Pest Control to meet your Noblesville home’s or business’s pest control needs. Some of the many great reasons are listed below! Our staff is trained to be able to handle any pest problem that arises on any property using the latest, effective technologies. We understand that pest control services need to be customized to suit the needs of each of our customers; we take the time to sit down with you can determine the best course of treatment for your unique situation. We provide a guaranteed 24-hour emergency service response. We offer environmentally friendly solutions to pests. We take pride in providing all of our customers with superior communication, including written service specifications. Give us a call today to learn more about any of Action Pest Control’s residential or commercial pest control solutions for your Noblesville property!